Home Archive DAN THE FAN: Can 1969 Heroes Inspire Current Crop Back to Form? After a season full of impressive away performances and disappointment at the County Ground, the Town faithful finally see some encouraging results at SN1 but Richie Wellens’ side bottle it on their travels in the most important week of the season. If Town had returned from Carlisle and Stevenage with a couple of draws or one win and a defeat that would’ve been workable to keep the playoff dream alive, but to come back with nothing from two crucial games has all but ended any realistic chance of a place in the top seven. Hopefully I’m wrong and we can go on a Tranmere style run, as Micky Mellon’s side have won five games in a row to take them from five points outside the playoffs six weeks ago, to now having a five point cushion inside the top seven, four points from the top three. Will we see Town win seven of their last ten games and make a late run for the top seven? To beat our points total from last season, let alone challenge for a spot in the playoffs, we need to earn nineteen points from a possible thirty, not impossible, but going by Tuesday night’s performance very unlikely. Apart from an encouraging 10 minute spell in the second half after the manager made three changes and switched to a 4-2-4 formation, Town looked devoid of ideas and sadly, didn’t look up for the fight. After carrying a slight injury into the game Kaiyne Woolery struggled to get into the contest and was replaced by Marc Richards with just over 30 minutes left in the game. But instead of making an impact Richards managed to look even more of a shadow of the player he was under Flitcroft last season. It’s now clear to all the club shouldn’t of given the striker an 18-month deal when he arrived in January 2018. You can’t blame him for extending his career and not retiring last summer, but from Saturday the manager should be looking to Ben House (when the loan rules allow), Jacob Bancroft and other youth team strikers who are desperate to take their chance. 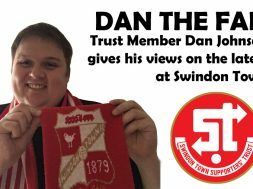 Hopefully this weekend we can all forget about the disappointment of the 2018/19 season, and celebrate the incredible achievements of the 1968/69 campaign when everyone associated with Swindon Town Football Club can celebrate the clubs finest hour. 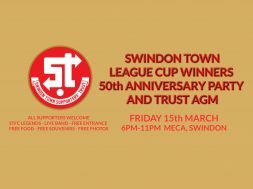 Those celebrations start at MECA in Swindon on Friday night as Trust STFC host their League Cup Winners 50th Anniversary party and AGM. Make sure you register and join the already 300+ Town fans attending the event, which promises to be a great evening. You can register here. 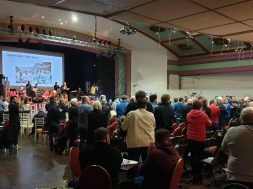 Not only looking back to the victorious 1969 League Cup final side, but to the exciting future of our football club as more detail will emerge regarding the proposed agreement with the council to purchase the County Ground in a joint venture with the football club. As we welcome Port Vale to the County Ground the next day there will be more celebrations throughout the day organised by the club and the brilliant Great Western Reds. Let’s hope the current Town squad can get back to winning ways and make it the perfect occasion to mark the clubs biggest achievement.